Talk about a mashup! Nanodots Magnetic Constructors combine math lessons, creative design, stress-relief, and – oh yeah – fun! Each Nanodot is a 5mm magnetic sphere measuring 5mm. Each is precision-milled from sintered (heated) neodynium-iron-boron – three alloys commonly found in magnets. The toy’s exacting uniformity makes it ideal for complex creations that leverage the power of magnetism. Nanodots also have superpowers. They can lift 1,000 times their own wait, are impact resistant, and designed to resist corrosion. Like LEGO, Nanodots can be combined in a seemingly infinite number of ways. Just look at creations on the company’s Dotpedia website, submitted the growing community of Nanodot enthusiasts. 216-Nanodot constructor packs are offered in a variety of colours, including black, silver, gold, red, purple, and blue. The complete package also includes an instruction manual, a yellow suede pouch, and a canister for storage. 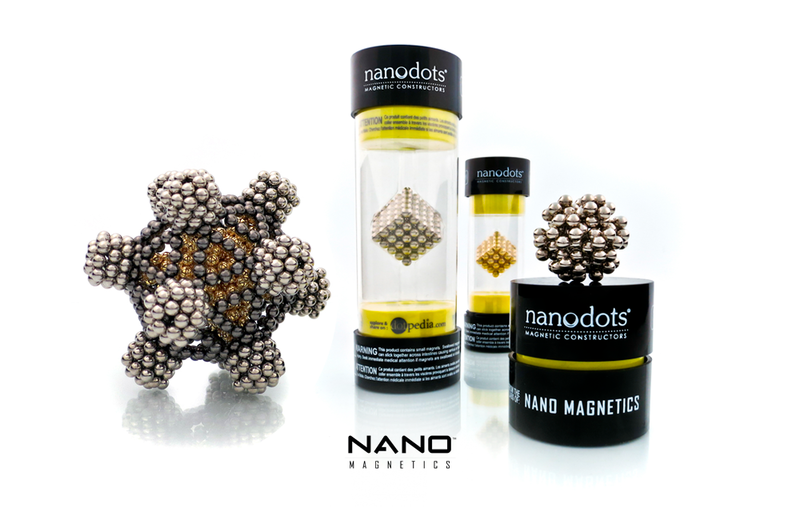 Nanodots Magnetic Constructors retail starting at $39.95 US. For safety reasons, the company sells the toy to adults 18 only. As an homage to the iconic video game Super Mario Brothers, Nintendo has created a limited-edition set of retro playing cards.